“I don't know how much longer I'll last,” she says. Nearing 90 she is between worlds, and there is not much I can do for her from a distance. Just listen. I don’t really know her. Our relationship is rusty. I learned at a young age to swallow pain and keep going. It is not a bad lesson. “How are you doing?” I ask each week when I call from my house in Sag Harbor, a former whaling village thousands of miles from Kansas. What she knows is she walks wrong. Bowlegged. Her father takes her outside after dinner and trains her to keep her toes pointed forward. Her mother buys her special shoes. Brown. She hates to wear them. The house is gone now, sold to pay for her care. Her parents have taken her to a new town. A tornado blows a sewing machine across the horizon. She is astonished. She wonders who gets it when it lands. She wants it. “Do you think so?” She laughs coyly. She curls around the pit of adolescence, fragrant with lust. She wants Paris gowns, hats with little veils, a wasp waist. She wants to be a fashion designer in New York. She swerves, tempted to linger, and is caught. He sits behind her in Latin class. He wants her to drink sloe gin. She refuses. I want to say, ‘don't be afraid.’ But I stick to practicalities. “What time is lunch?” I ask. She cooks every day for decades: meat loaf, chicken-fried steak, pot roast, veal birds, scalloped potatoes, Floating Island, Anadama bread. Peaches and berries on a Pyrex plate, fifteen minutes at 325 degrees. Done in a jiffy. She is so busy in the kitchen she has no chance to try her hand at anything else. After several years of trying, at last she has a daughter. She sews her a ruffled organdy frock. There is a long interlude of diapers and bottles and Madame Alexander dolls, with tiny dresses she makes herself, then piano lessons and golf clubs. Everything costs so much. At first she won’t let Francis kiss her. He is a smoker, and she can’t stand the smell. He is smitten. The two of them, too young for their parents to agree for them to marry, elope. “Your daylilies bloomed this summer,” I tell her. She had sent me a couple dozen before she moved out of the old house. She wrapped each one in newspaper with a tag giving its name in delicate tracings of pencil. Stella d’Oro. Mary Todd. Wine Cup. I planted them. In the spring, all the nametags were blank, erased by rain and snow. “I’m just waiting for what will happen next,” she says again. “While you're waiting, what do you think about?” I’ve always wondered. She has never revealed herself, only glimpses. “I figured it was you when the nurse brought me the phone,” she says after a long interval in which I can hear her labored breathing. “Happy birthday. Did you have a celebration at lunch?” I had asked the nurses to give her my gift at lunchtime, when she was most alert. She is in a wheelchair now, too heavy to walk. She is five feet tall and weighs 235 pounds. Her lower legs are swollen with edema. I think of the Willendorf Venus. They put her in a whirlpool and use ointment, but still there are blisters. She has fatigue, shortness of breath, lung congestion. The diuretics give her kidney failure; without them, she swells up. For much of her life she has “sick headaches.” Coca Cola is the closest thing she has to a cure. “Just fine. I just keep going. The same things. The plant arrived.” So now she remembers my gift. The following Sunday she is sitting right by the phone by the phone. She has already had breakfast. She has a bad cough. “When was Francis’s birthday, November 5 or 6?” I ask. The next time I call it’s a day of falling leaves, not a cloud in the sky. In the backyard in Sag Harbor I hear a steady sound as if there is a creature in the trees. It’s the leaves detaching and falling. It's the time for that. Something or someone drifts past, making the lower branches in the oaks by the side of the house sway in rhythm. That sound again: leaves, like the shadows of birds. She always said she hated her curly hair, now she seems to enjoy it. I look up: jet trails, falling leaves, a blue sky. She is quiet on the other end. “I love you.” I throw it out, taking a risk. It is a first. I want to ask her to repeat it, but I’m afraid she might not remember she has said it. I don't understand this love, how much it hurts. It makes no sense. We have nothing in common. Just blood. “I was thinking today about the story you told of being in a tornado as a little girl and seeing a sewing machine flying down the street,” I say. “I don’t know what happened to that sewing machine.” She is silent so long I fear she has fallen asleep. I am in the New Orleans airport, having visited a friend expecting her first child, when my cellphone rings. Kidney failure. She is not expected to last the night. Last. I imagine a long corridor lit with candles, her exit. She rarely left home. She never went anywhere without telling me where she was going. It is unprecedented, inexcusable even, for her not to be the weighty anchor back there in the center of the country. She was short on tenderness during the years I was growing up, but she was always there. I think of the last time we spoke. The sound in the trees. The heavy leaves, brown with age, heavy as leather, letting go. Jane Ciabattari is the author of the short story collection "Stealing the Fire." Her short fiction has been published in Ms., Literarymama.com, The North American Review, Denver Quarterly, and "The Best Underground Fiction" (Stolen Time Press, November 2006), and honored with O.Henry and National Magazine Award nominations and two Pushcart Prize "special mentions." Hampton Shorts selected her for an editor's choice "Stubby" award. She is a member of the board of the National Book Critics Circle and a regular blogger for the NBCC board blog, Critical Mass. 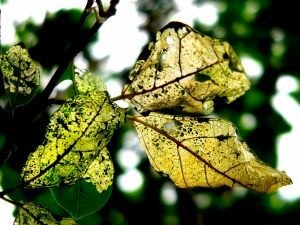 Photo "Lacy Leaves" courtesy of Dez Pain, Brisbane, Australia.